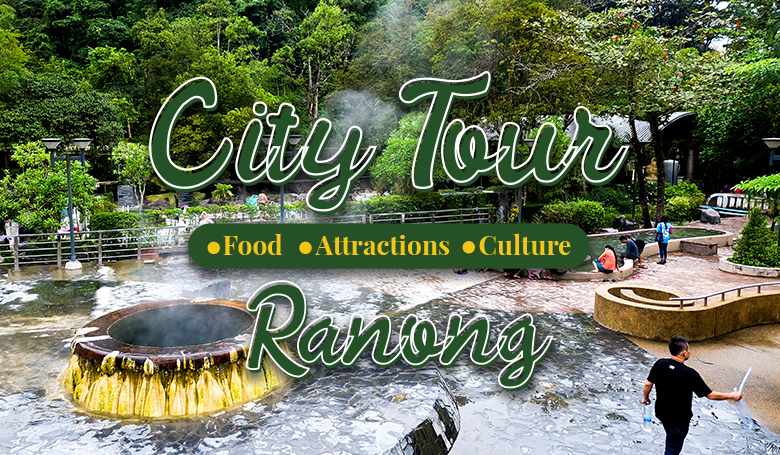 Home / Blog/Tours & Activities Review/Your Ranong City Tour: City of 8-month rain and 4-month sun. 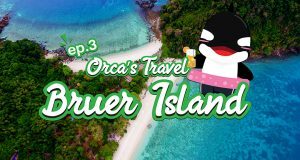 Once you visit, you fall in love with it! Ranong is a southern province of Thailand located on the west coast. 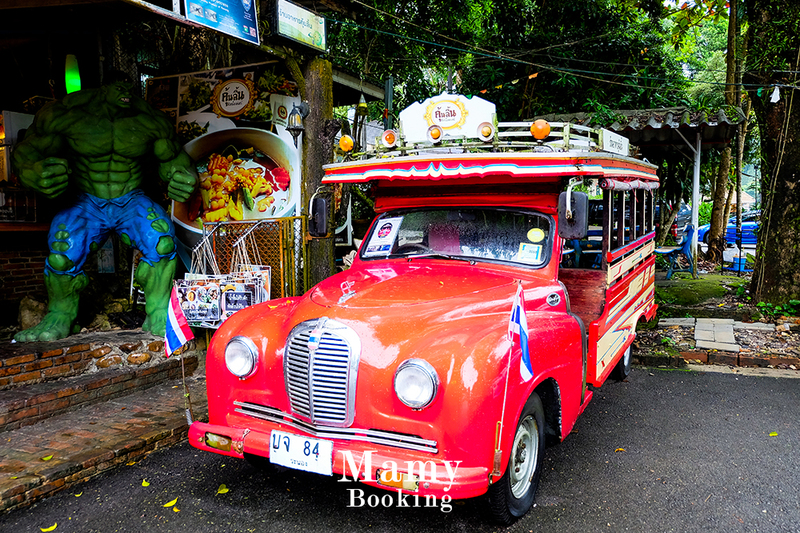 It’s undeniable that the province has become increasingly popular among tourists, both Thai and foreign nationals, since its attractions can be visited all year long. Moreover, there is an Unseen Thailand spot hidden in the province, waiting for travel enthusiasts to discover. 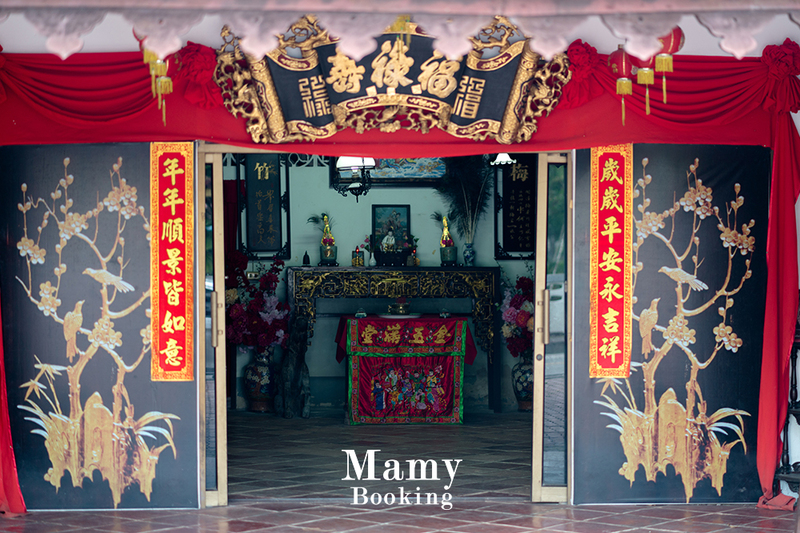 Many of you may not know yet what Ranong is famous for, so Mamy today will take you for a one-day tour around Ranong city. 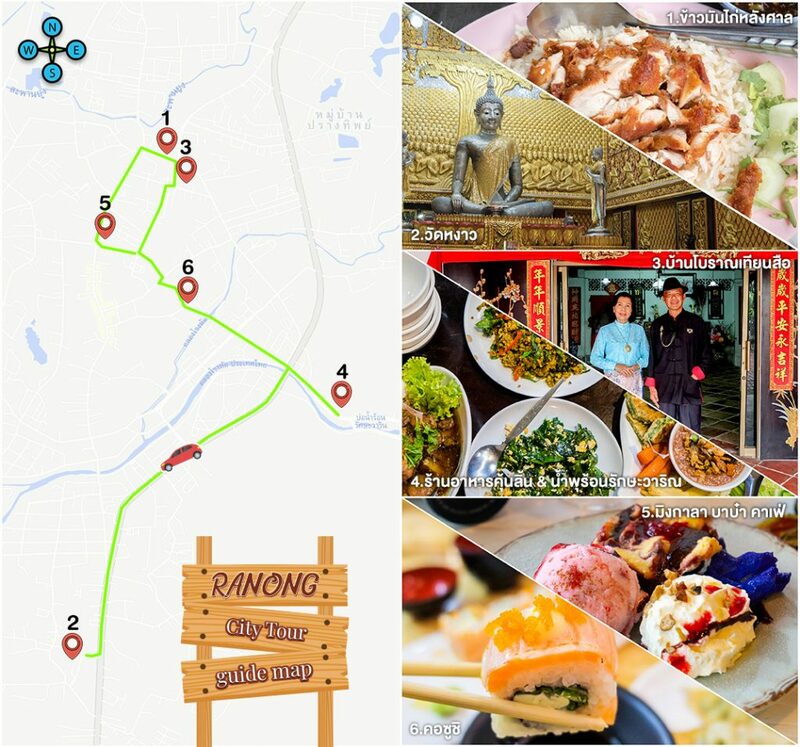 We also made a rough map of Ranong for you to see. 9A.M. 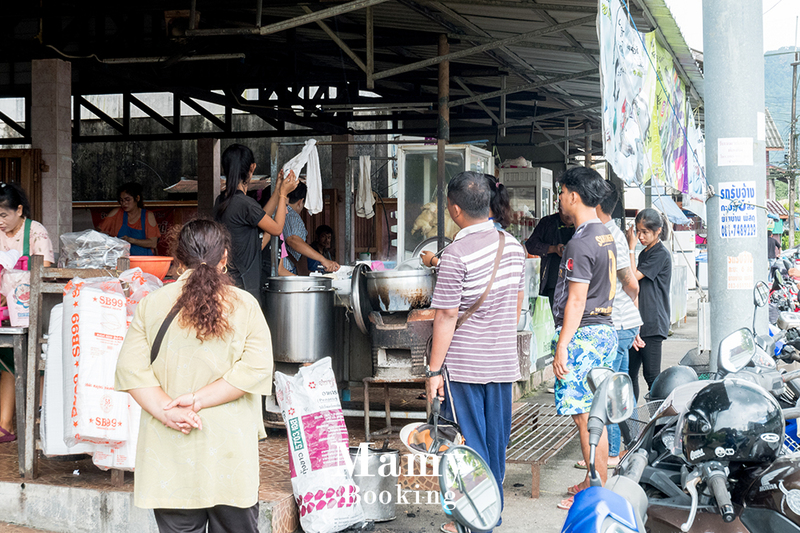 We have breakfast to give our body energy before setting off on a journey at Khao Mun Kai Lang Sarn, a chicken and rice restaurant located behind the Ranong Provincial Court.We wake up hungry and after we look up the schedule for the trip today, we decide to head out for something to eat. Then the thought comes up, ‘Hey, there was a popular chicken and rice place!’ So we waste no more time and take off to the restaurant. We drive on Dup Kadee Road before we see many motorbikes parked in front of the restaurant where many people already come to eat. The place has been packed since the beginning of the day. The staff members there work quickly and competently. There are quite a lot of customers who buy to-go food. We go straight for a table to sit first because the restaurant starts to get fully packed. When we get our seats, we look around the restaurant once again. Wow. It’s soooo crowded! There’re a variety of people from local people to students and government officers. We’re wondering how delicious the chicken and rice here could be, so we order two plates of mixed chicken and rice: one regular plate and another is special. But what’s stunning to us is this: the regular plate is already a lot! The plate serves a lot of rice, boiled chicken and deep-fried chicken. We aren’t surprised anymore why the place attracts so many customers: It’s the cheap prices and vast quantities of the food. The special plate arrives with a large dish filled with even more rice and chicken. This restaurant also specializes in their dipping sauces. They’re super delicious. 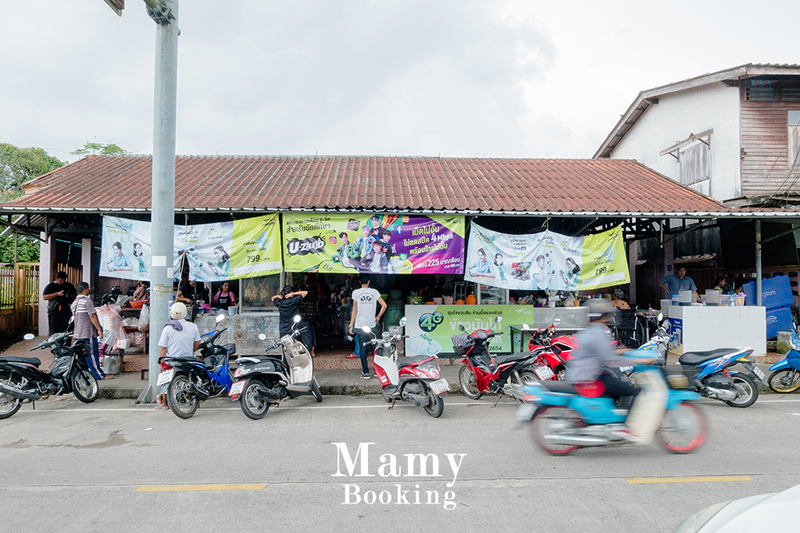 So if you’re in Ranong and want something to stuff your belly, we really do recommend this place. Regular plates served here already come with special quantities. If you’re not starving, do not order special plate. We’ve warned you. After our stomachs are full, we move on to do something we believe it’d bring happiness and prosperity to our lives. 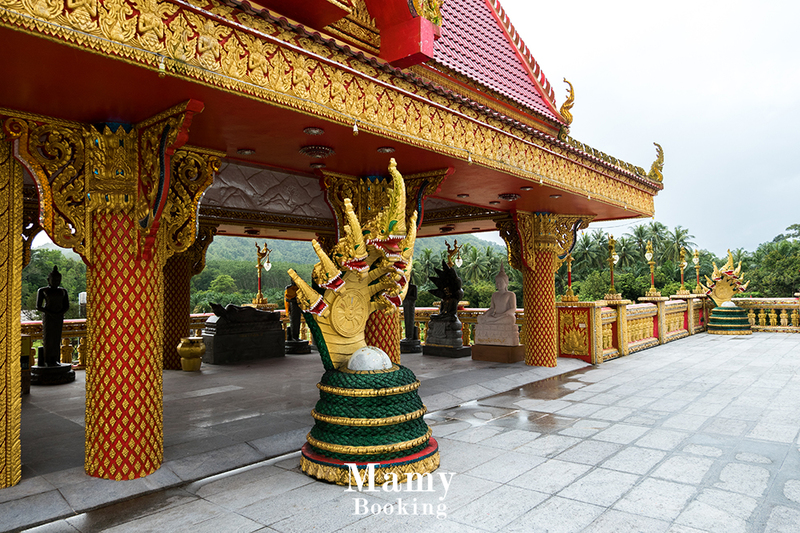 Since we’re in Ranong, we must visit the province’s most respectable temple: Wat Ban Ngao. 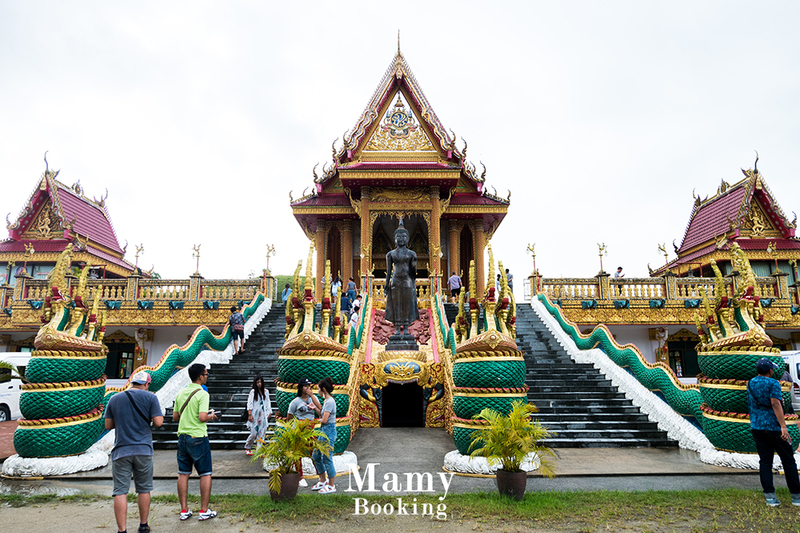 The temple is located quite far from Ranong city and it takes about 20-minute drive to reach the place. 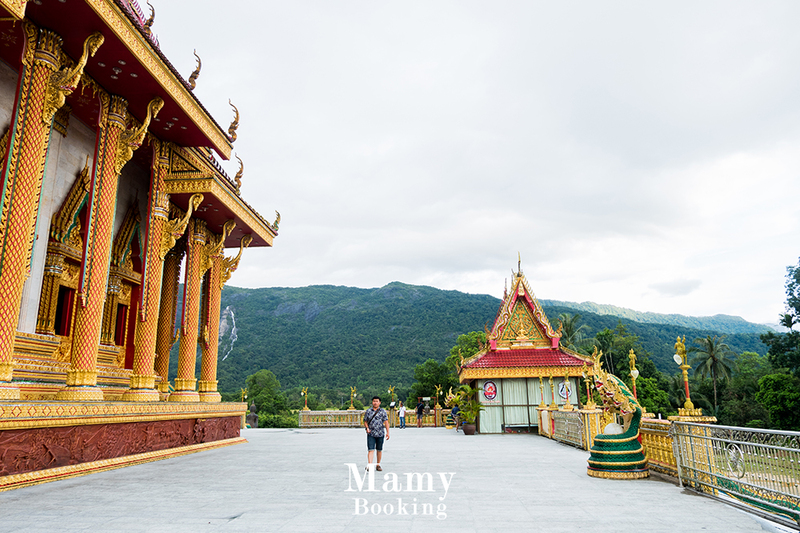 Wat Ban Ngao sits in Ngao sub-district of Ranong city. 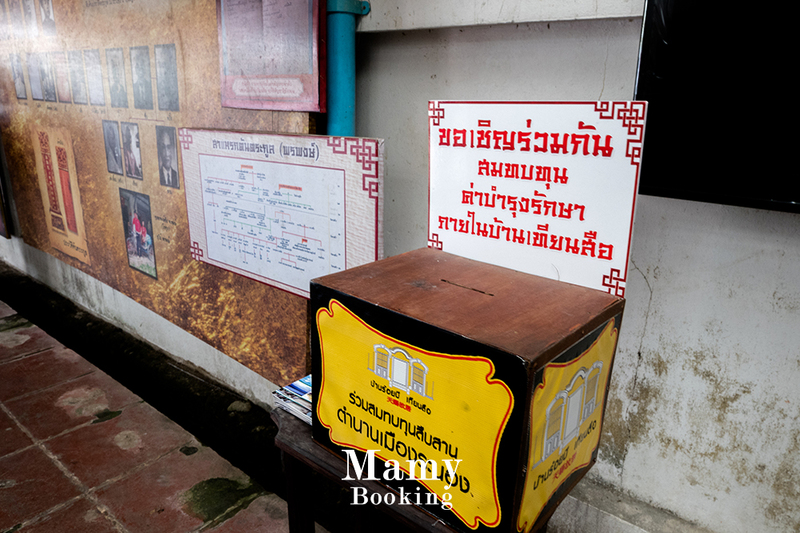 The temple originally was a residence for monks, until Luang Por Kiad, Buddhist monk who traveled on a pilgrimage from Pattani arrived and stayed at the temple. As the local were faithful in Luang Por Kiad, they then built the temple in 1987 and offer it as a residence to Luang Por Kiad. Nowadays, Wat Ban Naho has an abbot named Phra Kru Prajak Sutasarn, who is an inventive monk. Because of him, there have been many changes made to the temple such as a new, large ordination hall which is decorated beautifully. 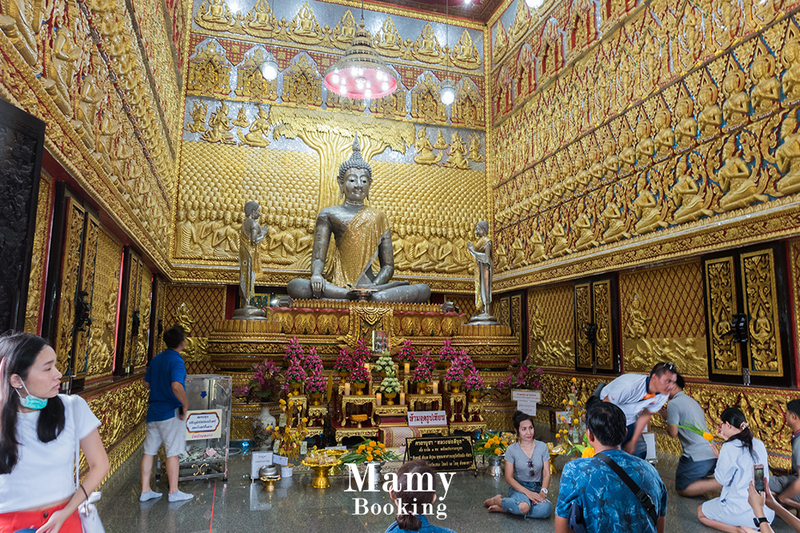 The highlight at Wat Ban Ngao is the world’s biggest Buddha statue made from tin in the attitude of subduing Mara. It’s officially called Phra Tipuka Maha Sakkayamuni Sriranang. The temple complex is filled with calm atmosphere. 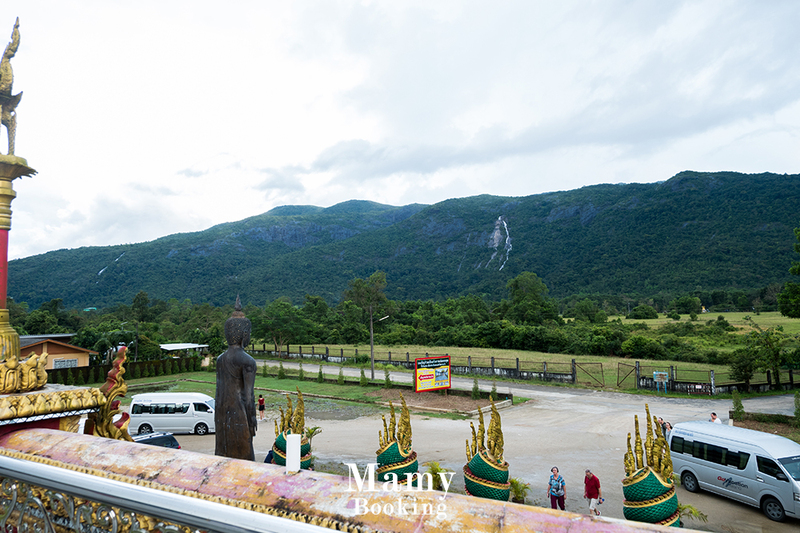 From the temple, we can spot the Ngao Waterfall flowing down from a mountain. At the rear of the ordination hall, there are 300 flights of stairs leading to the top where Buddhists ring bells for a good luck. 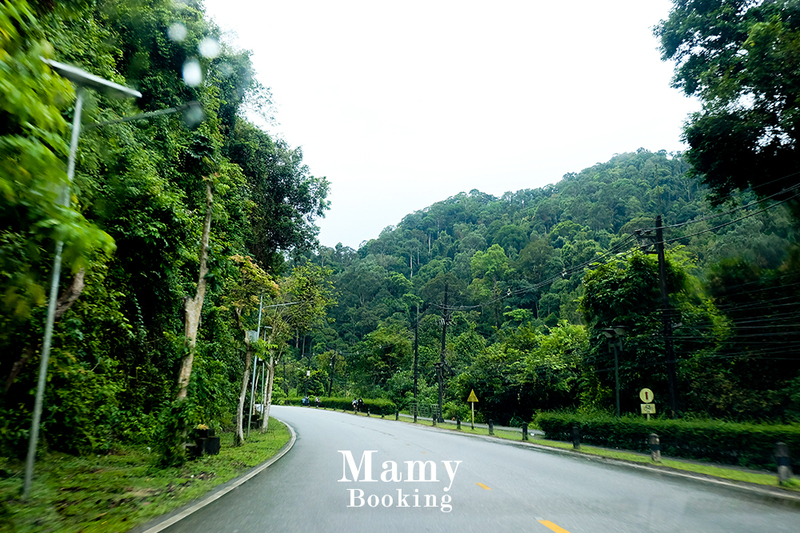 Over there, we can see a panoramic view overlooking Ranong city. 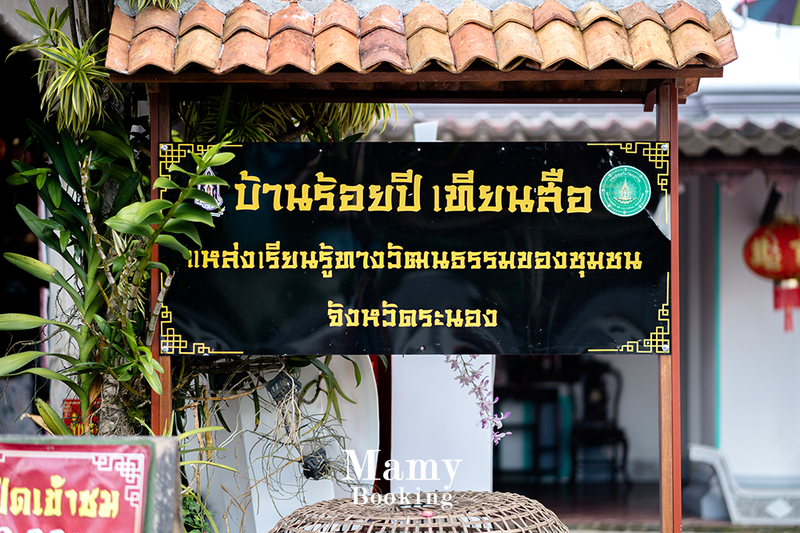 The place recently was developed to to be a cultural attraction in Ranong. After asking for a good luck, it’s time for us to educate ourselves. 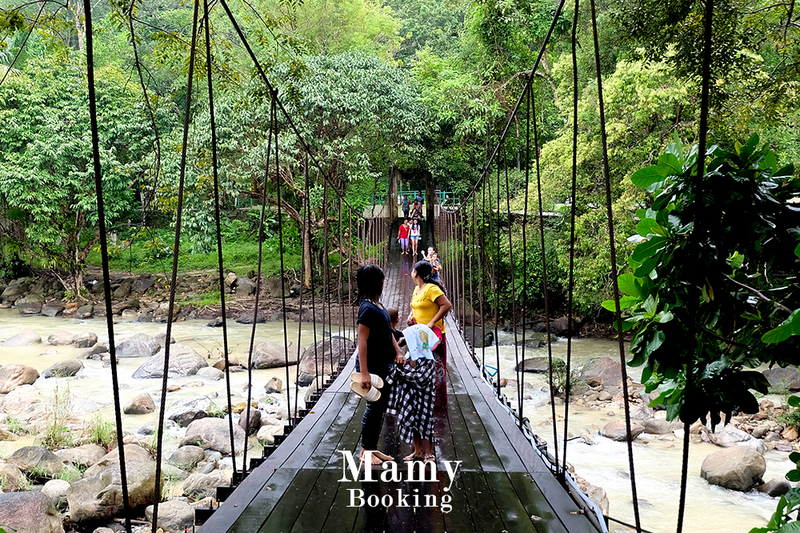 So we decide to take everyone to another place that promotes the cultural and historical heritage of Ranong. 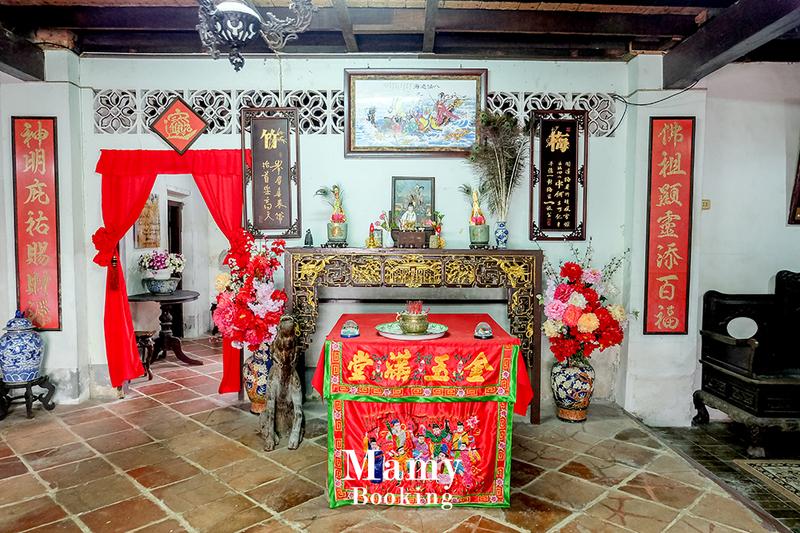 Ban Roi Pee Tian Sue, or Century-Old Tian Sue House, is situated in Ranong city. 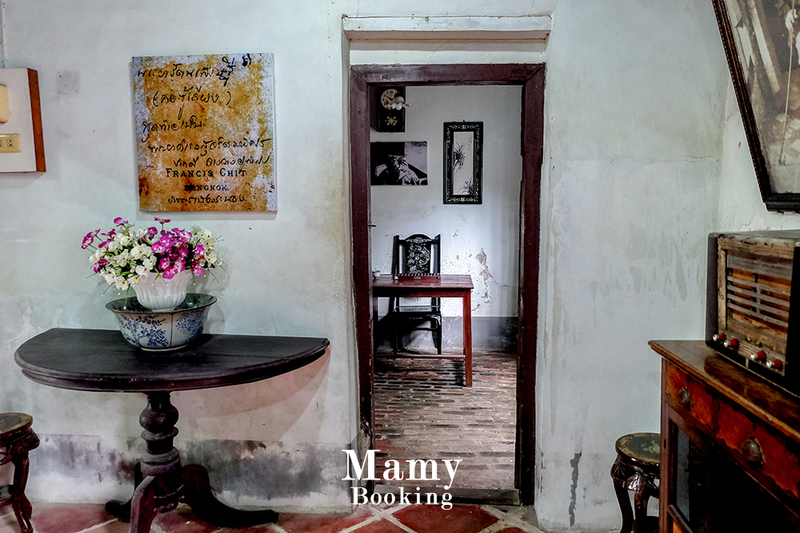 The over 150-year-old house was built during the reign of King Rama V. It’s billed as one of the oldest houses in Ranong city. 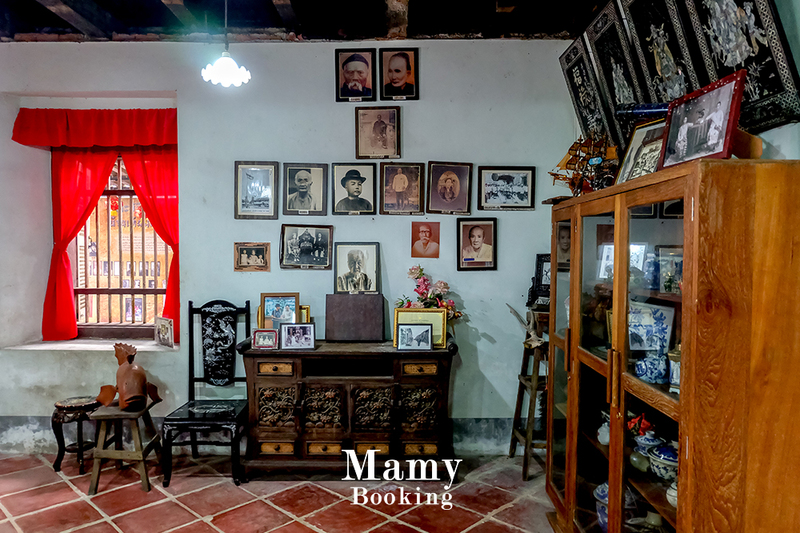 The house is also known as a learning center that gathers knowledge about Ranong’s local communities’ history and culture. 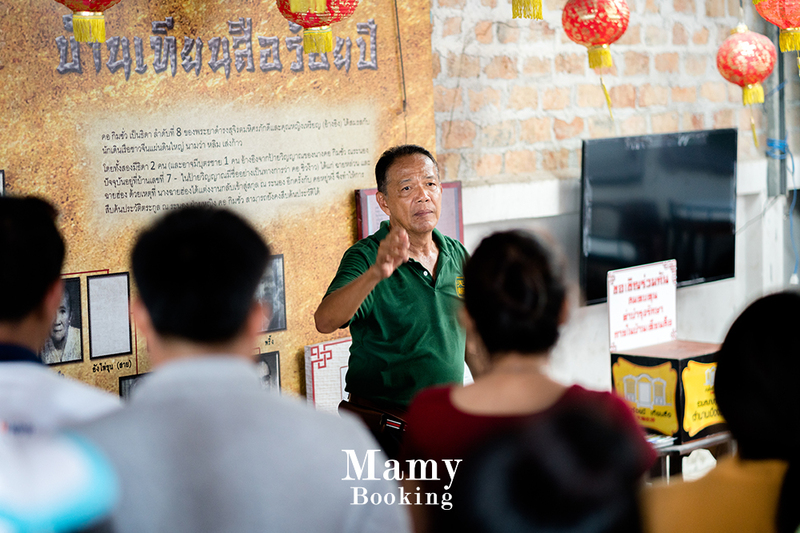 We consider ourselves very lucky because on the day we visit the house, we’re welcomed by “Ko Sup,” the current owner of the house. 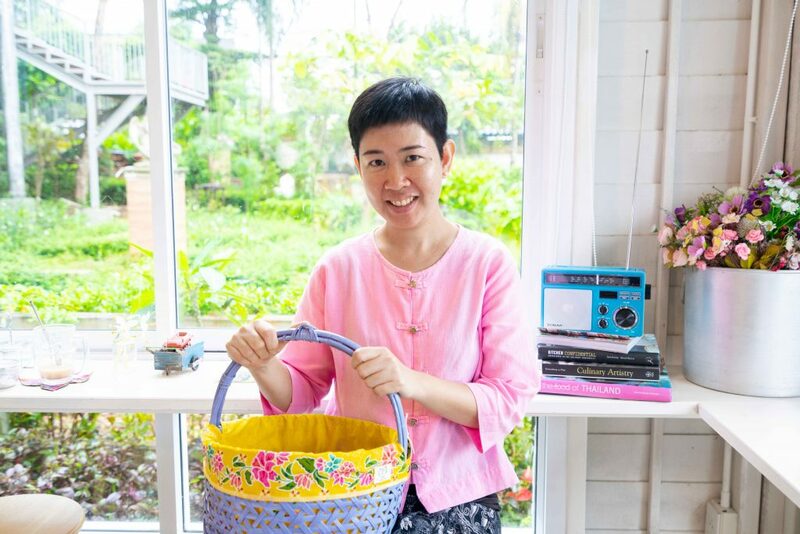 Ko Sup shows us around the house and tells us the background story of Ranong province. Ko Sup tells us many interesting stories we don’t want to miss out a single part about them. 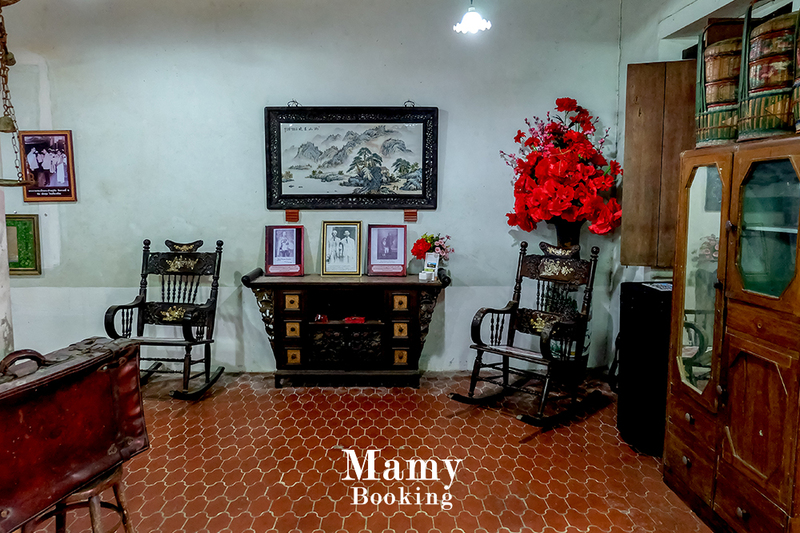 When we enter the office that once belonged to Ko Su Jiang, Ko Sup’s ancestor, we feel the room is filled with history of Ranong. We have a chance to sit on Ko Su Jiang’s chair and get goosebumps. 12:30P.M. After we learn about the history of Ranong, it’s time to feed the stomach again. 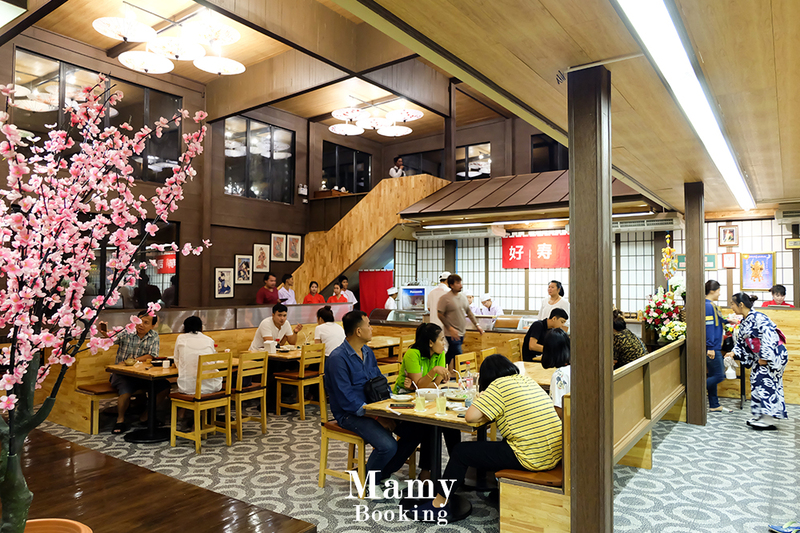 We just can’t miss superb local cuisine so we direct our way to Khun Lin restaurant which is located opposite to Raksa Warin Hot Spring. 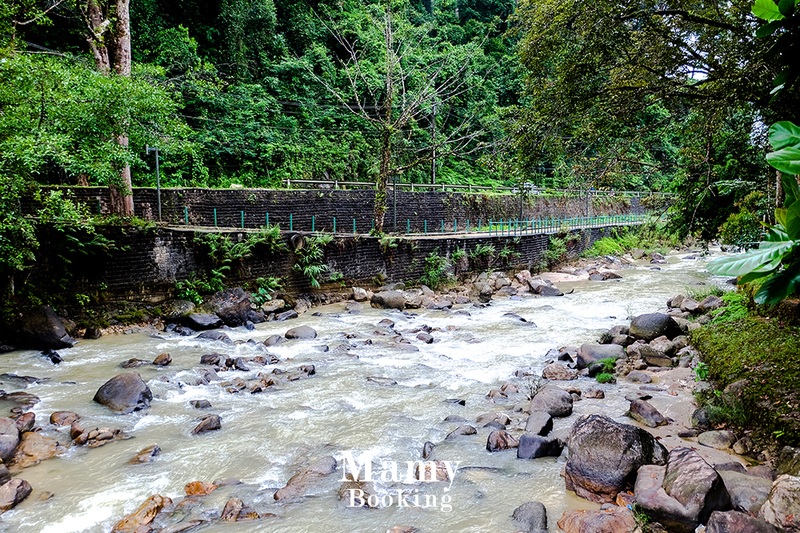 Khun Lin is located on Chon La-U Road and opposite to Raksa Warin Hot Spring. 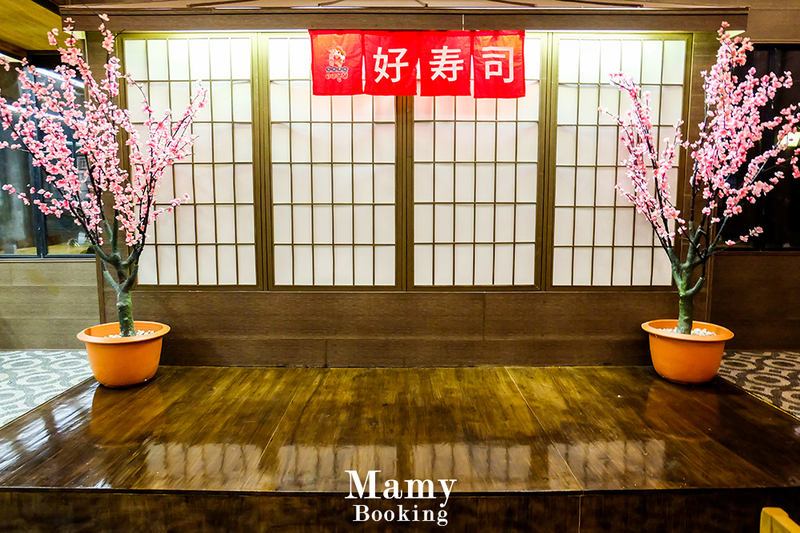 The restaurant is decorated beautifully with lovely corners for visitors to take a picture with. It also has a gimmick which is colourful Japanese handmade dolls called “Teru Teru Bozu.” They’re believed to bring stop or prevent a rainy day. et’s talk about the food there. 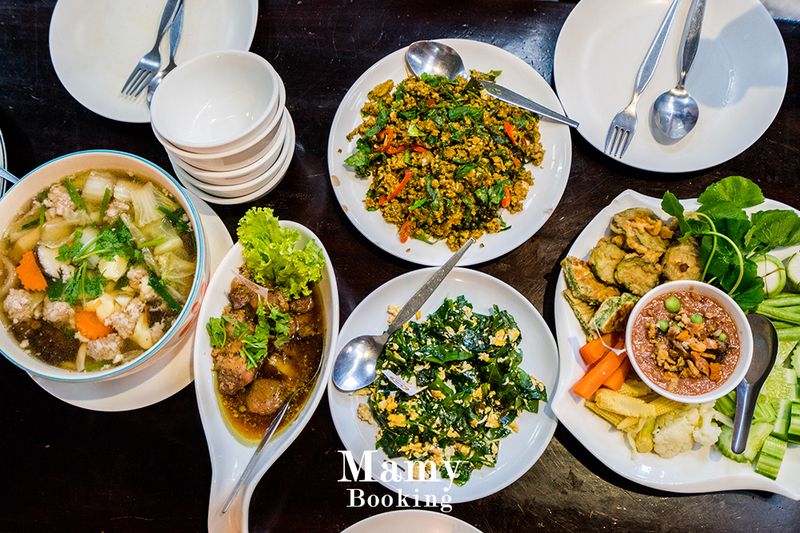 Khun Lin is best known for its southern Thai dishes so expect most dishes here to come with spicy flavours. 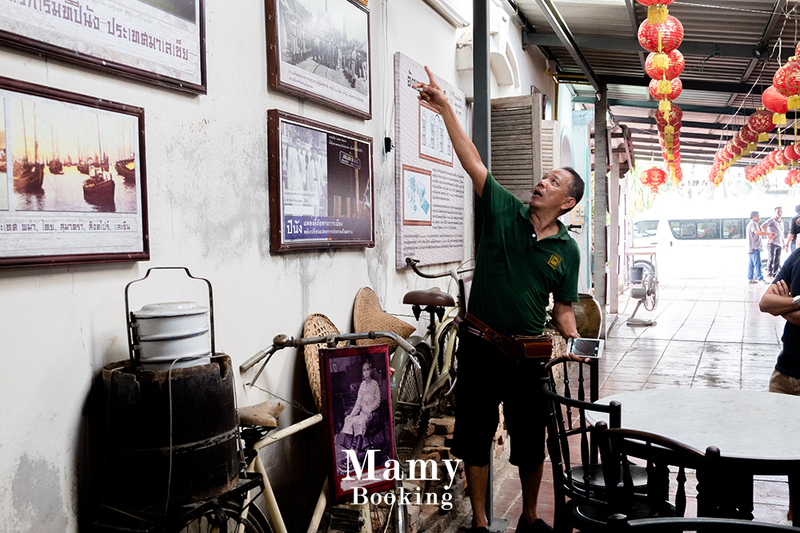 The restaurant’s highlight that no one should miss is “Nam Prik Khai Pu” or minced crab egg in chili paste dip. 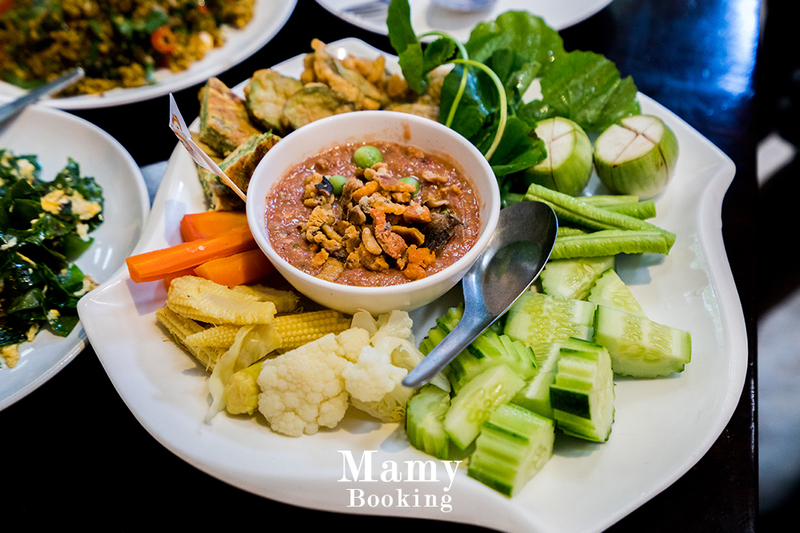 The dish is served with a large plate of deep-fried and boiled vegetables and it is really tasty we love it so much. Oh! There’s another gimmick of the restaurant. 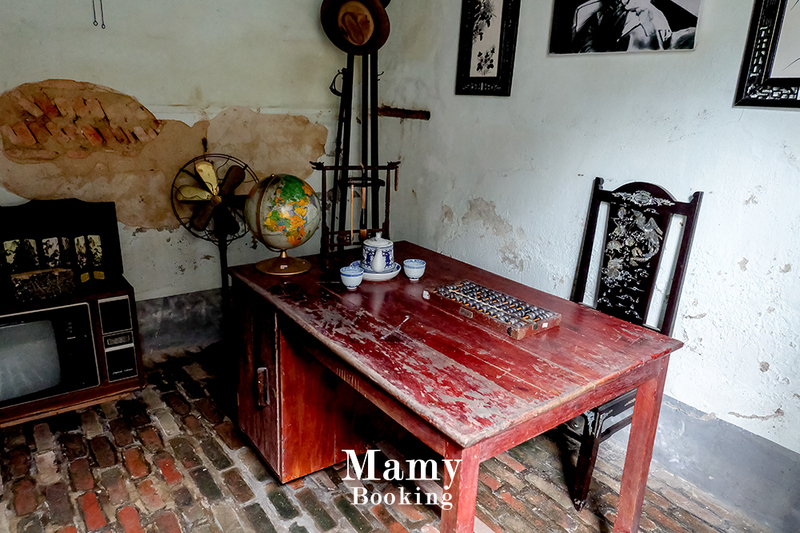 If you cannot decide what to order for the meal, the restaurant offers a helper: Kau Chim fortune sticks. You just pick a plastic tube and shake it until the first stick comes out. The stick’s label would tell you which dish you should order. 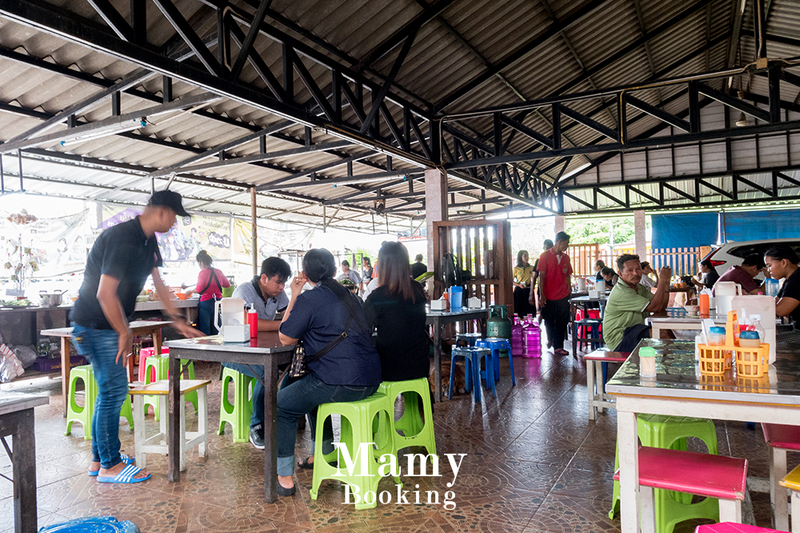 For anyone who comes to Ranong by any chance, make sure you visit this restaurant for a meal. We don’t want you to miss one of the province’s best highlights! 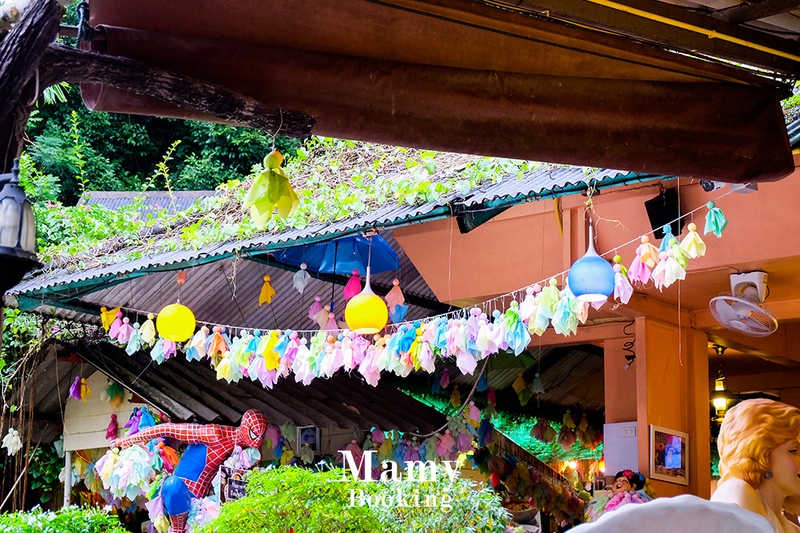 After we finish eating, we’d like to take you to another popular attraction in Ranong. 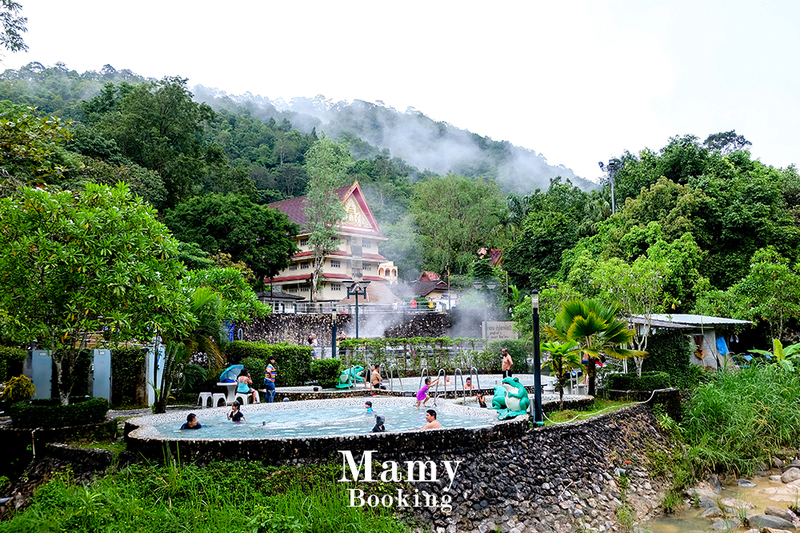 It’s nicknamed “Thailand’s onsen” and it’s only located opposite to Khun Lin restaurant. 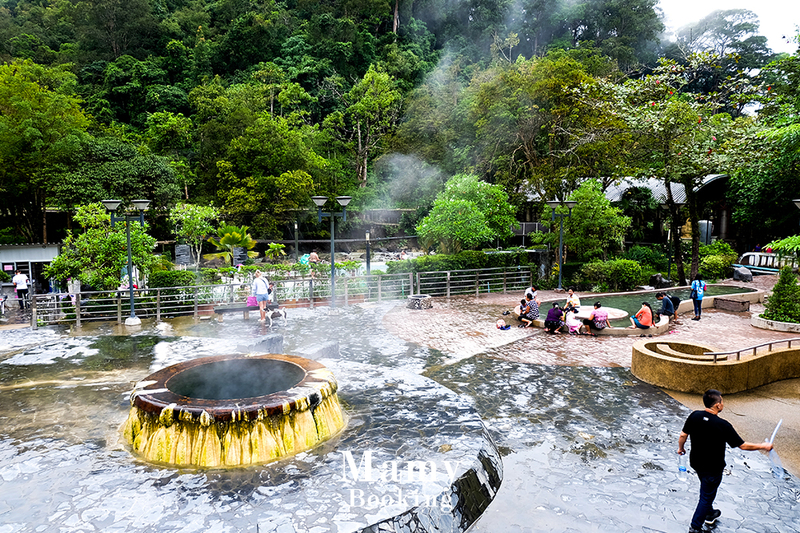 Raksa Warin Hot Spring contains a total of three natural hot springs: a father, mother and child. 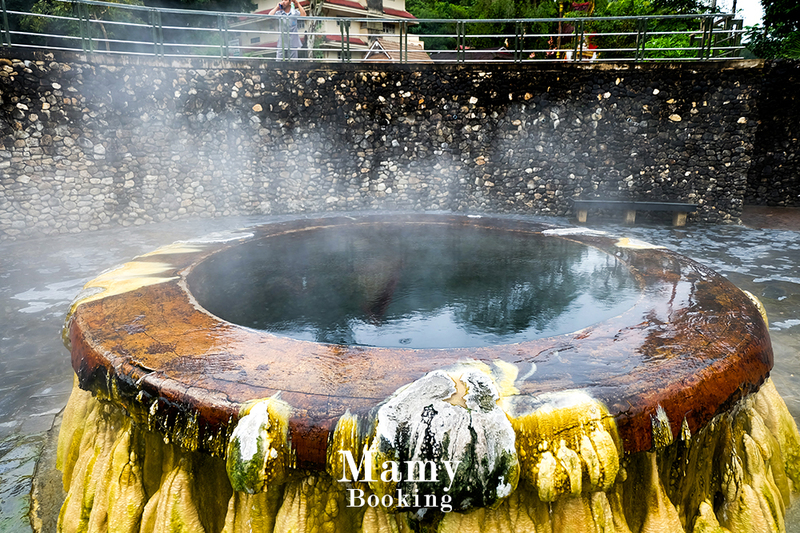 Each hot spring has water with temperature up to 65 degree Celsius! It’s almost possible to boil an egg here. 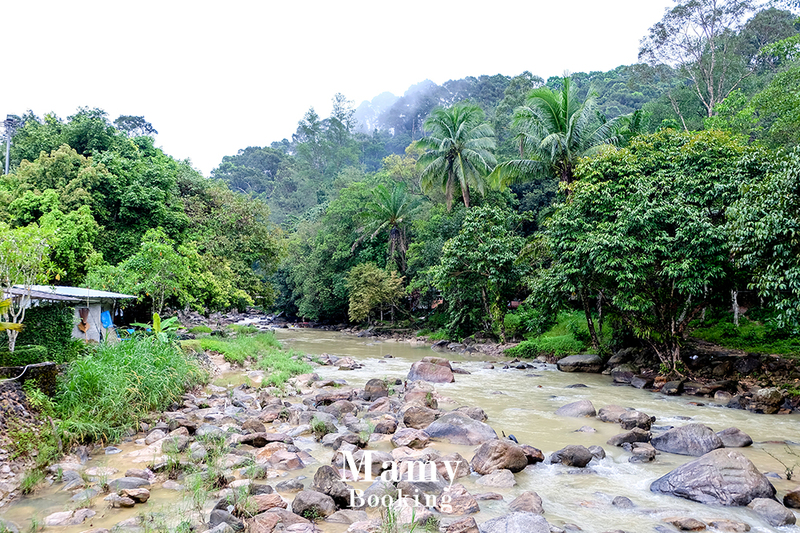 Rainy season lasts in Ranong for about eight months while sunny days barely exist in the province. It’s true as they say because the day we go out, it isn’t sunny at all. The weather is rather chilly and a little damp after the rain. At the hot spring, there is a bridge leading to another side. Be careful though, because if there are many people walking on the bridge at once, the bridge can sway and cause us to lose balance. Looking back from the bridge, we see some people soaking in the hot springs. The view includes the steam released into the hazy clouds and the mountain in the back, as if we were in Japan. 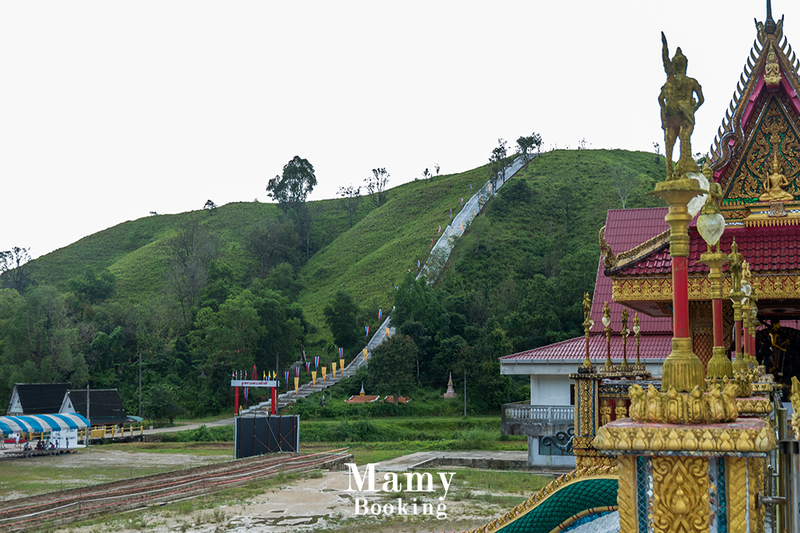 As many of you know already, Ranong is a southern province that borders Thailand’s neighbouring country Myanmar. 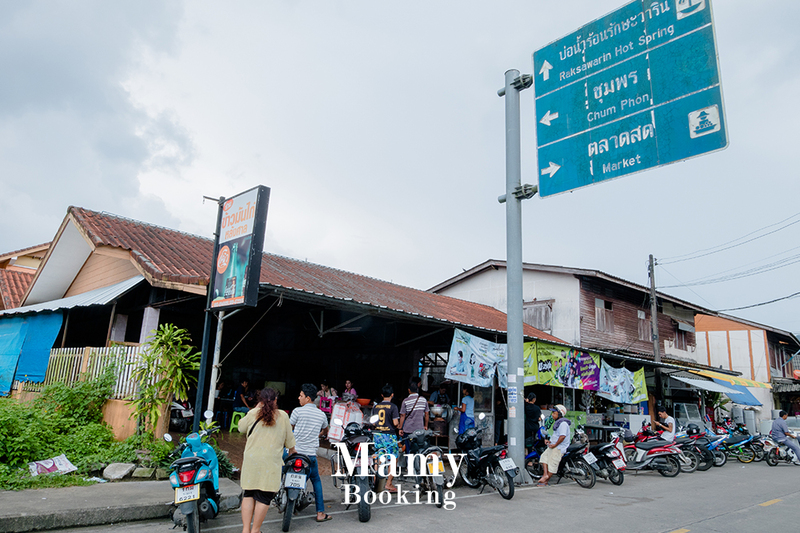 Therefore, there are many Burmese nationals living in Ranong city. 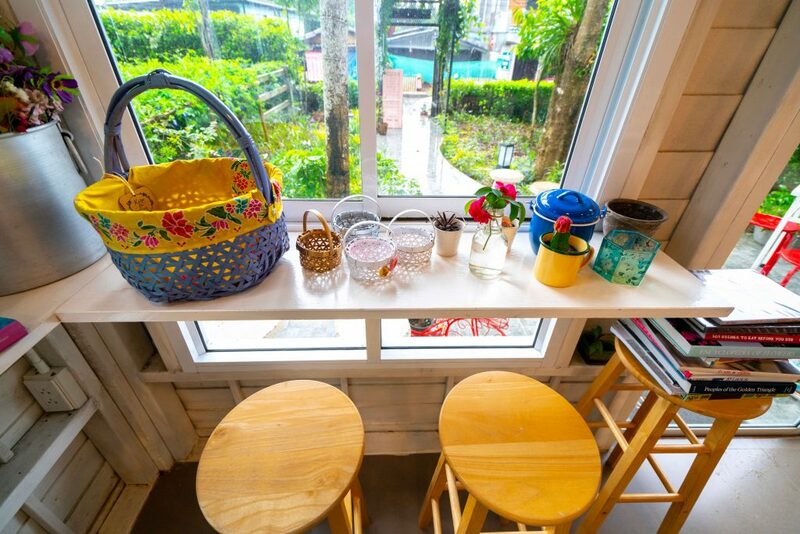 We discover a small cafe located on Ruang Rat Road. It’s called Mingala Baba. 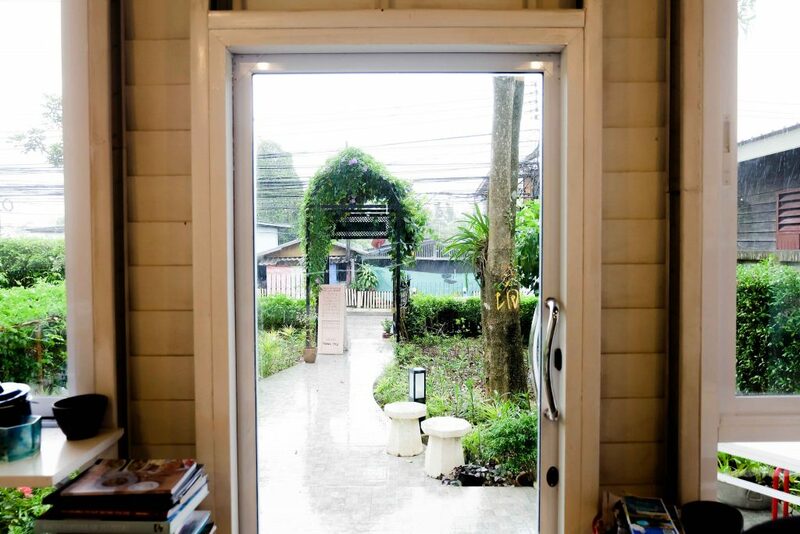 The cafe, painted in white, sits in a garden surrounded by lush greenery. 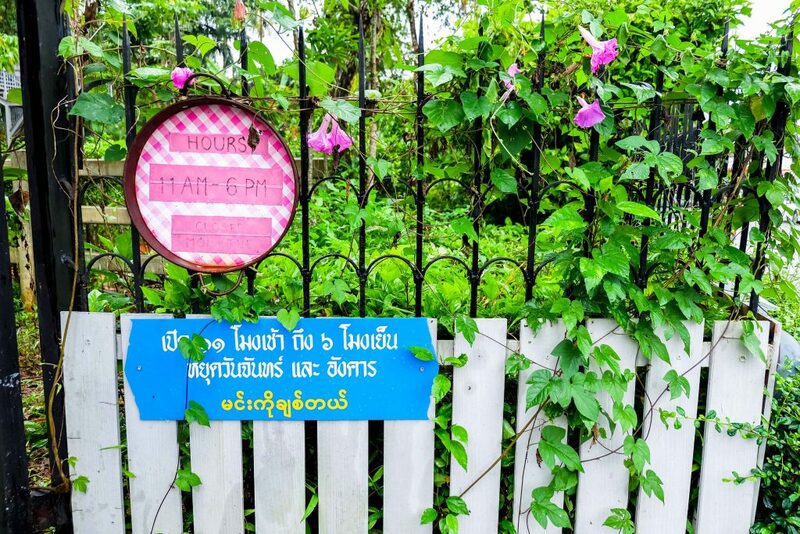 In front of the cafe, there is a sigh with a quote saying and greeting words in Thai, Burmese and Chinese. Lovely, isn’t it? The cafe is open and cozy. Customers can pick a seat from those at the tables or those at the bar. 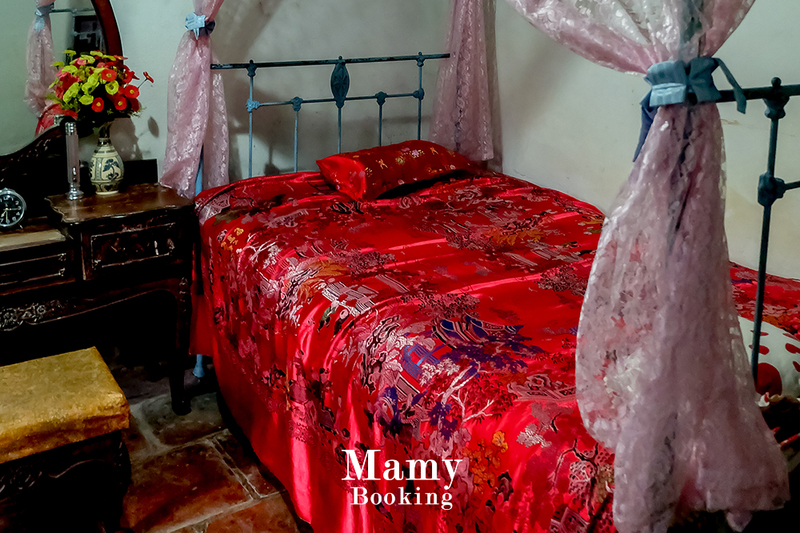 Most decorations here are handmade and they fill the place with local atmosphere. 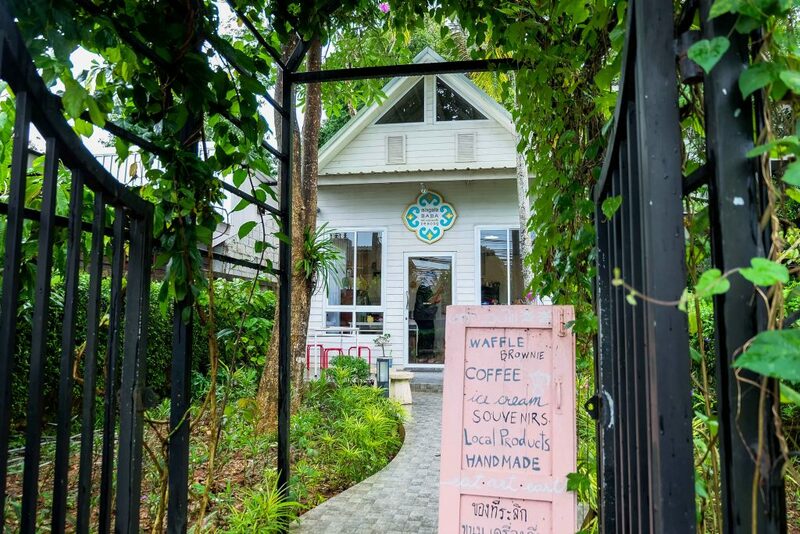 The name of the cafe also shows it: They combine “Mingala,” which is a greeting in Burmese, with “Baba,” the term that is rooted from local Ranong tradition. Once we look outside, the rain is already heavily pouring down. But then we think, ‘It’s okay’ because there are still so many things to explore inside the cafe. 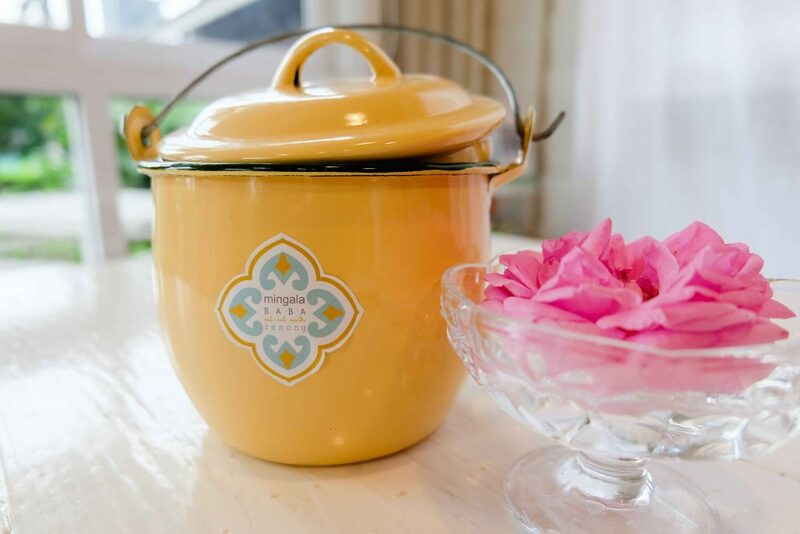 The vintage-style utensils used in the cafe may remind many of you of the childhood. They’re quite pretty and good for the photos, right? 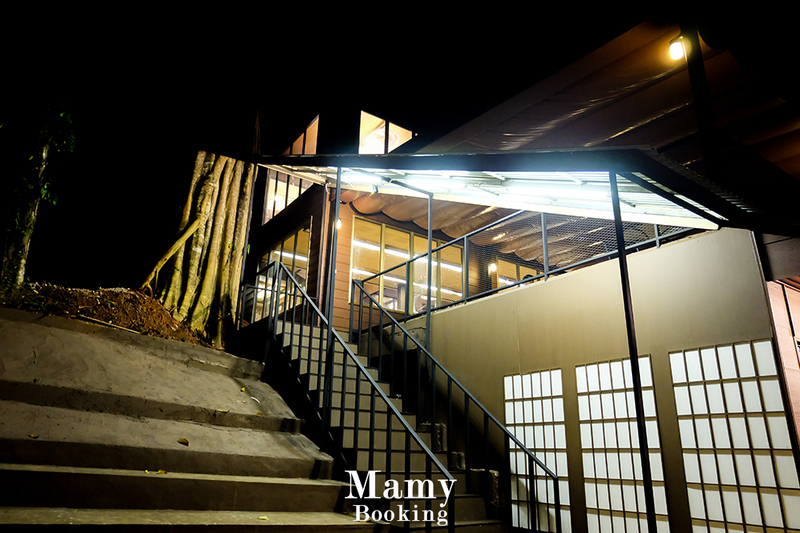 The cafe offers only a few drinks and desserts, but tastiness and creativeness are guaranteed. 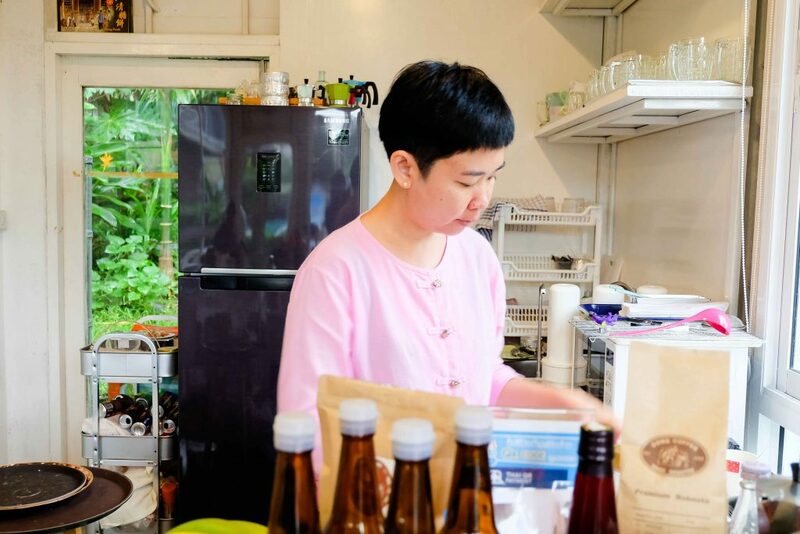 The cafe also serves homemade bakery. 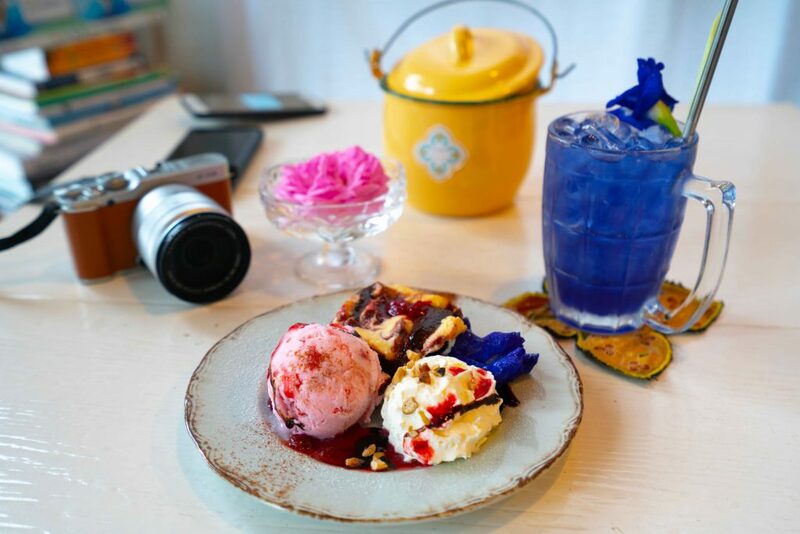 We order waffle and ice-cream, and butterfly pea tea with lemongrass and lime. 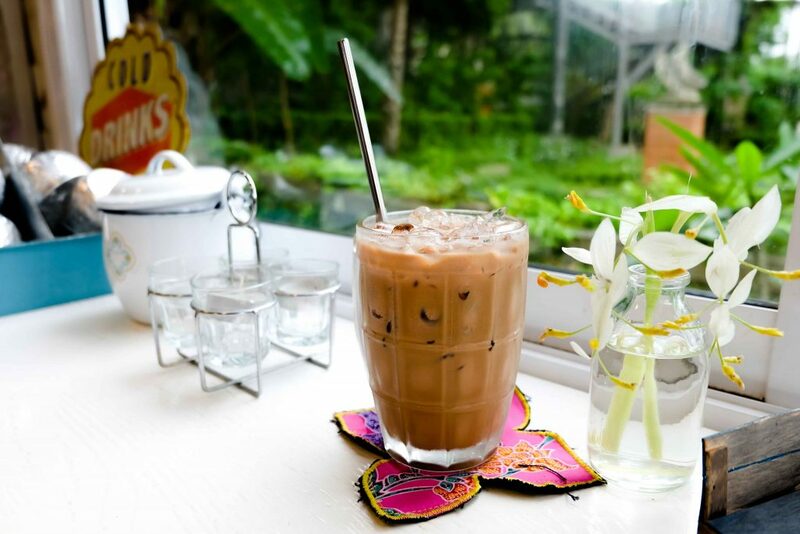 There is another drink that we totally recommend for those who love caffeine: Burmese tea. Of course, it’s quite different from Thai tea. Apart from its good smell, the taste is also smooth and refreshing. The cafe owner is pretty attentive in cooking. 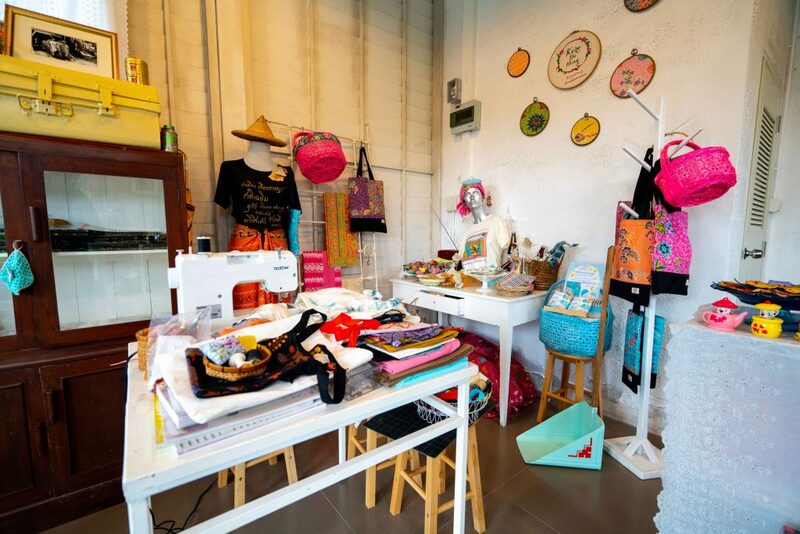 Handcrafts here are redesigned from “sarong,” traditional southern clothes, and they’re sold as souvenirs. Although the cafe is small, but there are so many interesting things inside. The cafe owner is also friendly and talkative. 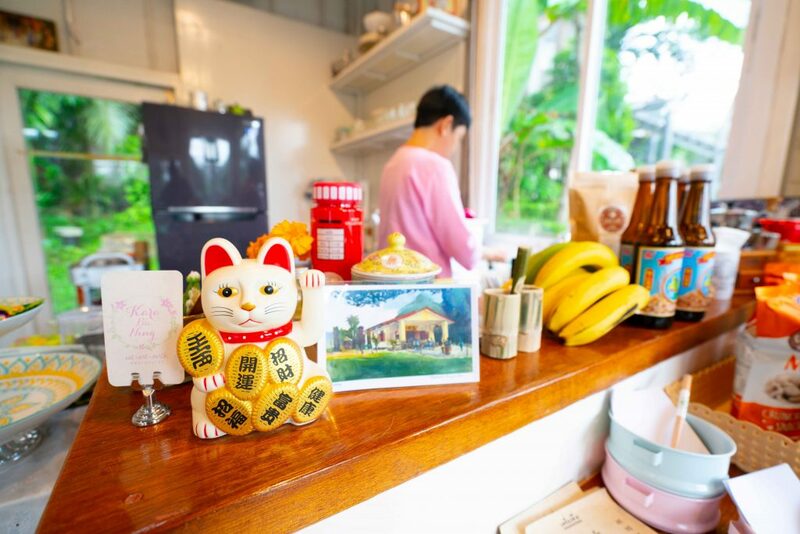 She tells us about Ranong’s historical background and local people’s way of life, until we glance at the watch and realize we’ve been at the cafe for two hours. Before we head out, we ask the cafe owner to take a picture together. Thank you for having us. It’s time to say goodbye now and we’ll come back again. 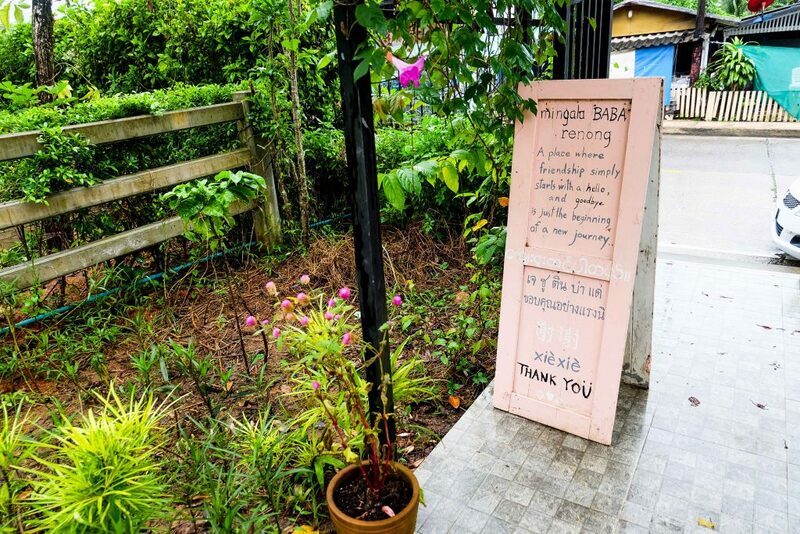 Mingala Baba Cafe opens from 11am through 6pm every day, except Monday and Tuesday. 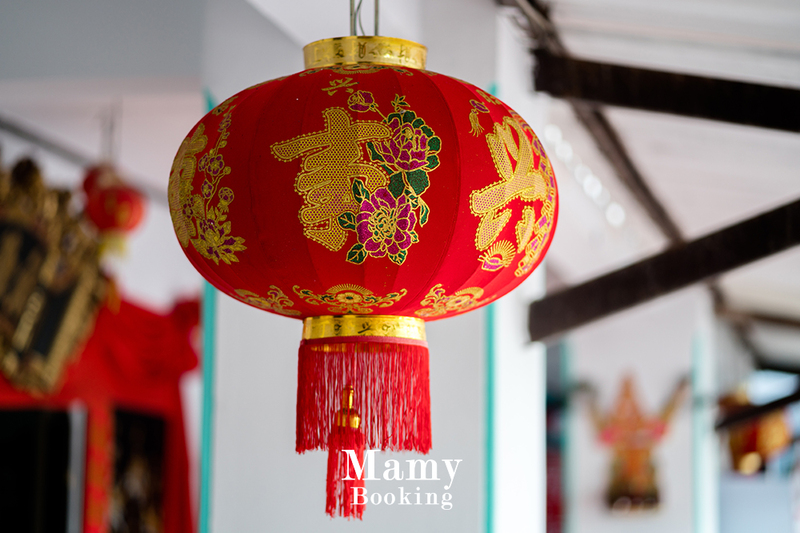 It’s located opposite to Chok Din restaurant on Ruang Rat Road. 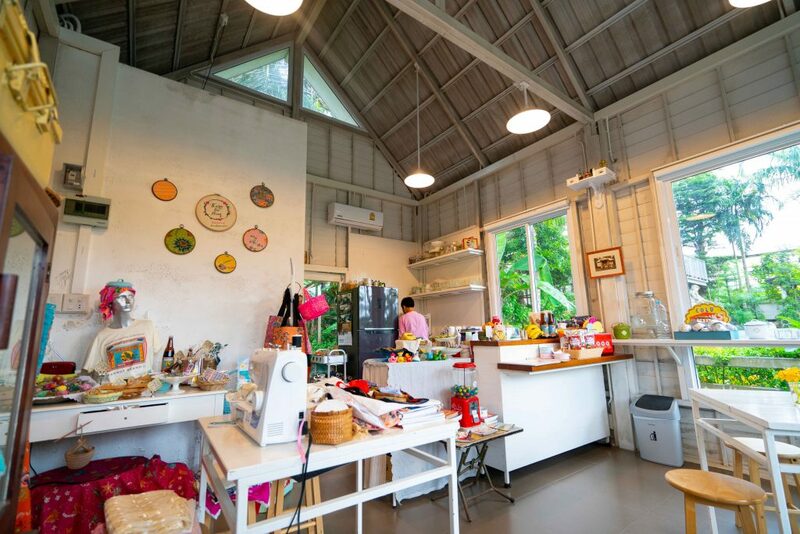 If you have a chance to come to Ranong, don’t miss this cafe. After we travel all day, we decide to reward ourselves with nice dinner. 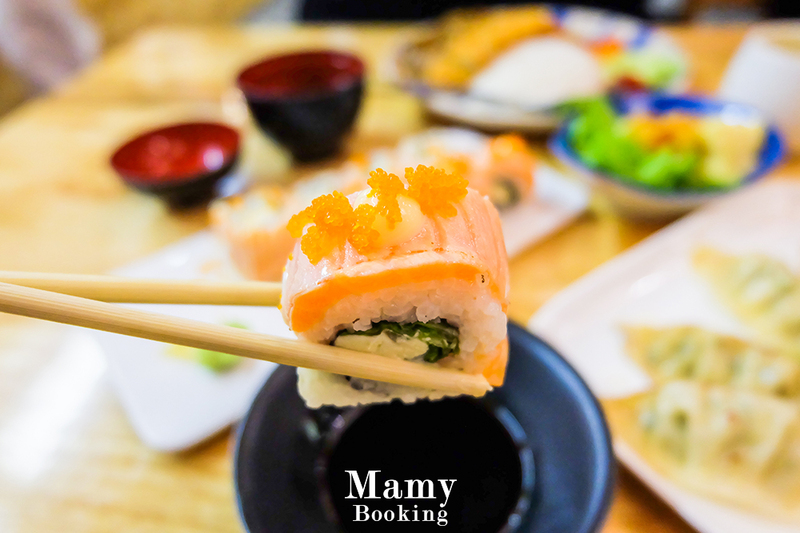 So we go to Kor Sushi, which is super popular in Ranong. 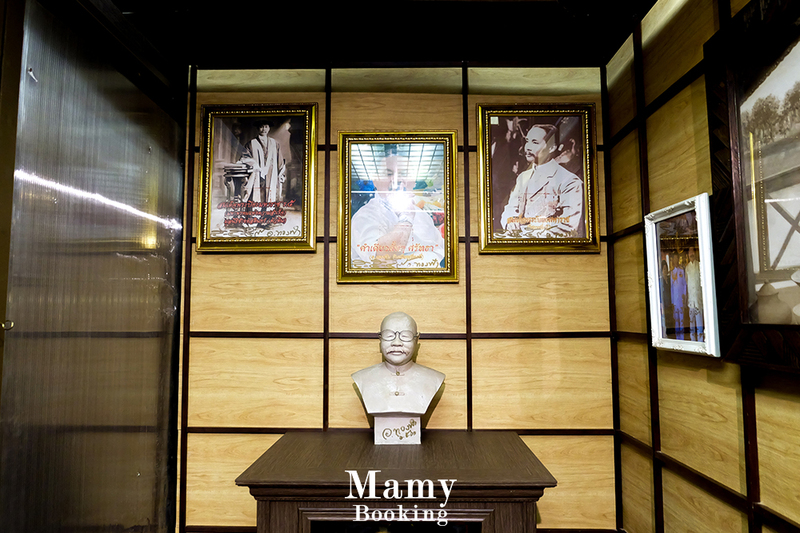 It’s located opposite to Rattana Rangsan Throne Hall in Ranong city. The place is always packed with people. Formerly, Kor Sushi used to be only a small restaurant with only five to six tables, but it was renovated into a much bigger place with three storeys. We enter the restaurant and suddenly it’s as if we arrived in Japan. A Japanese music is playing along as a staff dressed in red Kimono comes to greet us. The rest of the staff says “Irasshaimase!” (“welcome” in Japanese.) 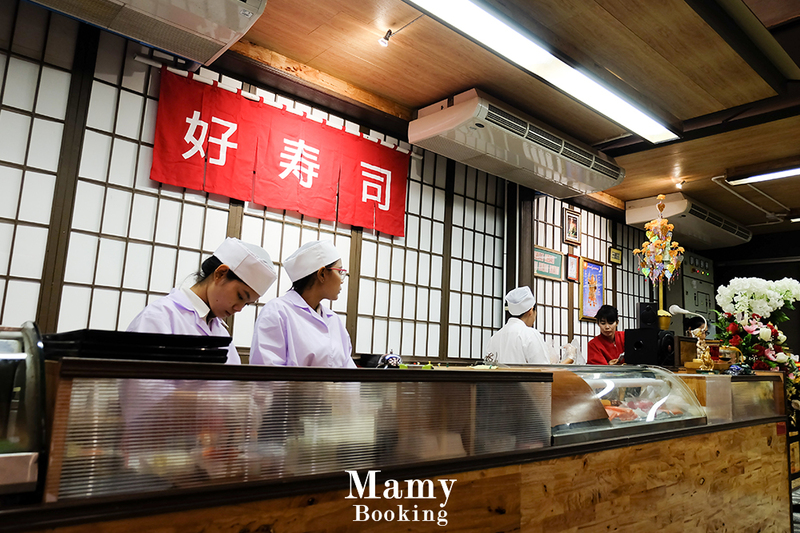 Then the staff in Kimono shows us a table. We’re lucky to meet the owner of the restaurant who provides us his service. He tells us the restaurant was renovated only a few days ago and we’re welcomed to take a picture anywhere. So we use this opportunity to explore the restaurant. There are two types of kitchens: a hot kitchen and cold kitchen. We walk upstairs to the third floor and take some pictures. We’re impressed by how the restaurant is decorated. 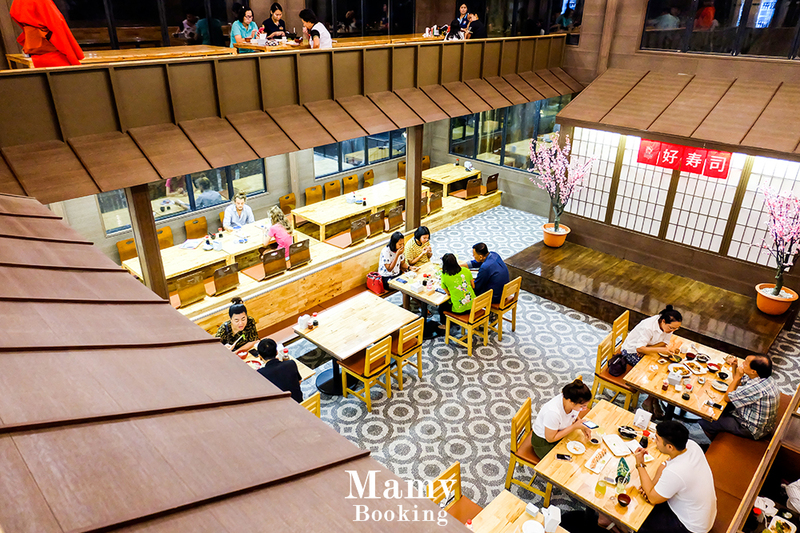 There are regular dining tables and also Japanese-style dining tables. If you sit on the third floor, don’t worry that you won’t get a good service. The staff always makes sure all the customers are provided service they need. Next, we’ll show you the food here. First dish is rice and Japanese curry with squid. 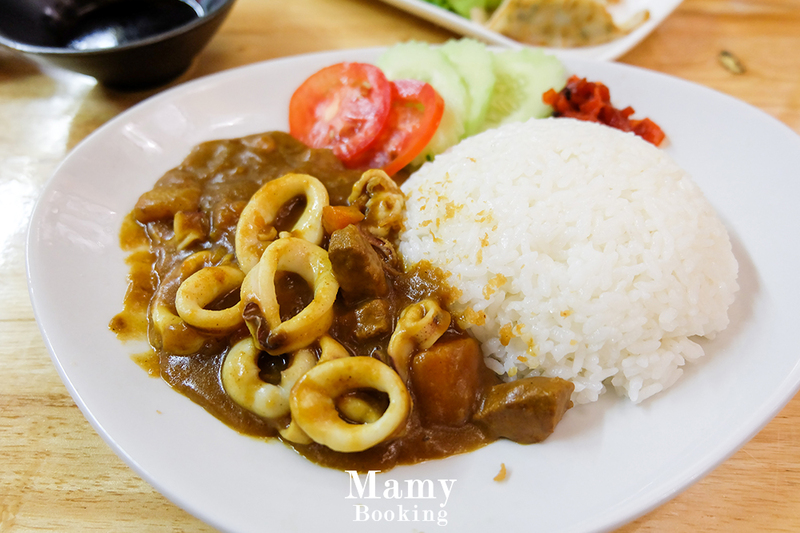 The curry is so rich, plus the squid is crispy. We just love it. 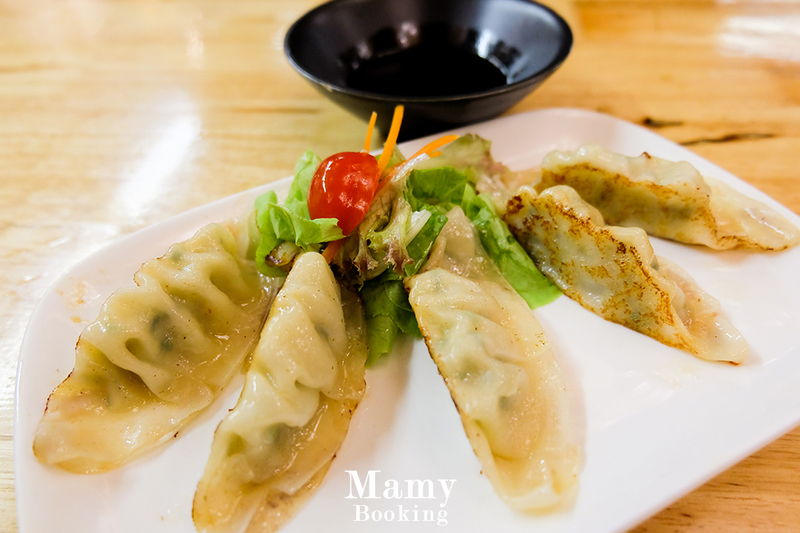 Gyoza or Japanese pan-fried dumplings are stuffed with a lot of ingredients. 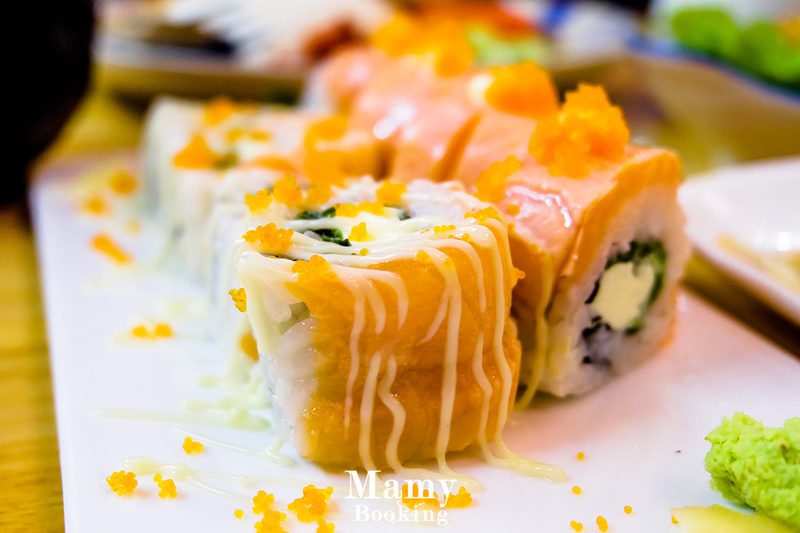 Although it’s just an ordinary dish, we’d recommend you to order it. One dish has almost 10 salmon rolls and each of them is huge. If you don’t usually eat a lot, you would be full after three pieces. But we don’t give up easily! Look at the size, everyone! If you notice, there are a lot of customers walking in and out. Each table is never empty for more than five minutes. 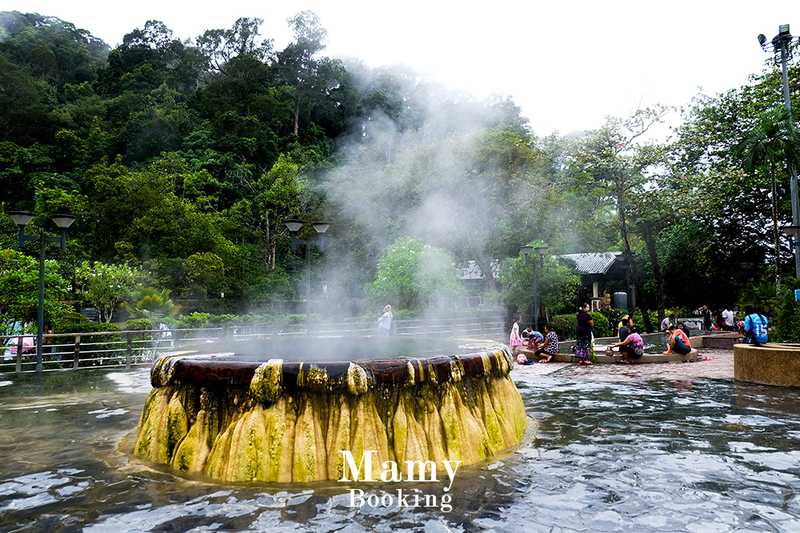 It’s surely popular among Ranong people and tourists. Before we head out, we took a picture with the staff. All of them take care of us really well. Before we walk out, they thank us in Japanese “Arigatou gozaimashita.” We’d totally come back next time we’re in Ranong. Oh! 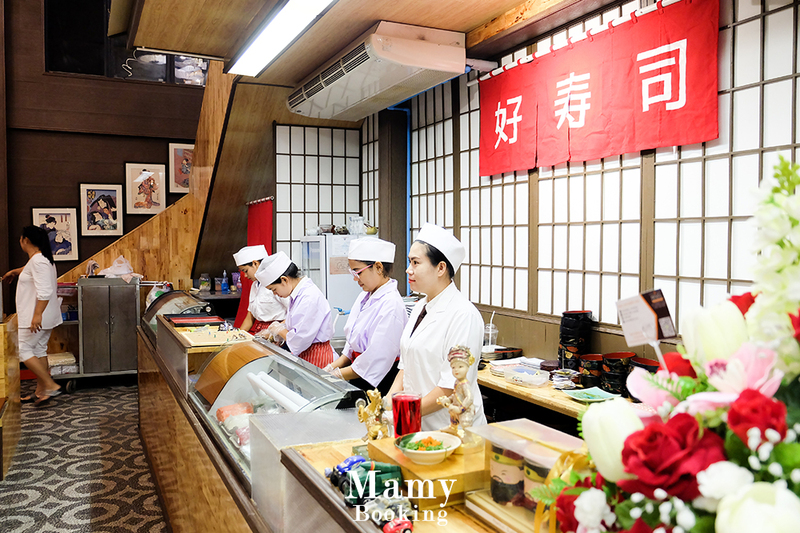 The restaurant owner also tells us that soon the place won’t serve only sushi, but it will become a one-stop service that includes a restaurant, onsen (Japanese hot spring) and ryokan (traditional Japanese inn) with live music performance. That’s it for our Ranong city tour. What do you think so far? 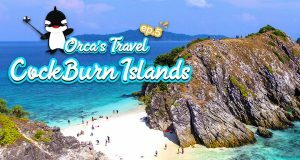 The city is undoubtedly worth traveling to and local people here are very friendly. Plus, we fell in love with the local culture and tradition here. 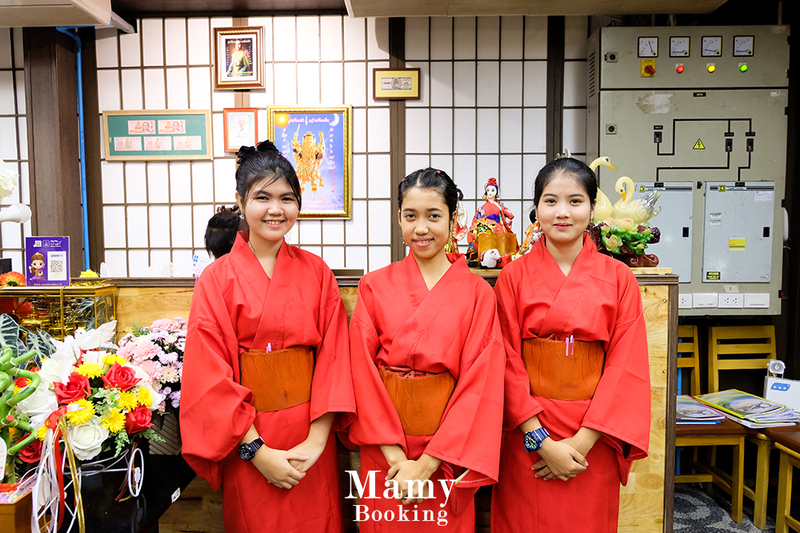 We hope this review would be helpful for you when you travel in Ranong. 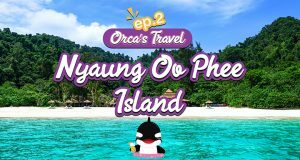 Don’t forget to subscribe us for our next trip! Bye bye. See you soon.